Manufacturing sales rose 1.7% to $52.2 billion in July, as sales in the motor vehicle parts and motor vehicle assembly industries increased. The gain follows revised increases of 0.7% in May and 1.5% in June. The advance in July mostly reflected a higher volume of goods sold, as constant dollar sales increased 1.1%. Higher sales of motor vehicle parts and motor vehicles were responsible for almost two-thirds of the national increase in July. Gains in food products and fabricated metal products bolstered the advance. Lower sales of primary metals offset a portion of the growth. Sales of motor vehicle parts rose 12.1% to $2.6 billion in July, following a 0.4% decline in June. Canadian parts manufacturers supply domestic, American and Mexican assembly plants. In July, scheduled shutdowns for North American assembly plants were shorter than in previous years. Sales in the motor vehicle assembly industry rose 5.6% to $5.3 billion, a third consecutive increase. Overall, 12 out of 21 industries reported higher sales, representing 62.8% of the manufacturing sector. Sales of food products rose 2.3% to $8.2 billion, reflecting widespread increases led by dairy manufacturers. Fabricated metal products rose 3.1% to $2.9 billion in July, following a 5.4% decrease in June. Sales of primary metals fell 3.0% to $3.7 billion and moderated the overall gain. The industry has been generally trending downwards in 2015. In 2014, price-related gains in iron and steel mills and ferro-alloy manufacturing led to higher sales of primary metals. Conversely, lower prices for the sub-industry in 2015 have contributed to recent declines. For more information on the 2014 trend, see "Manufacturing: The Year 2014 in Review." 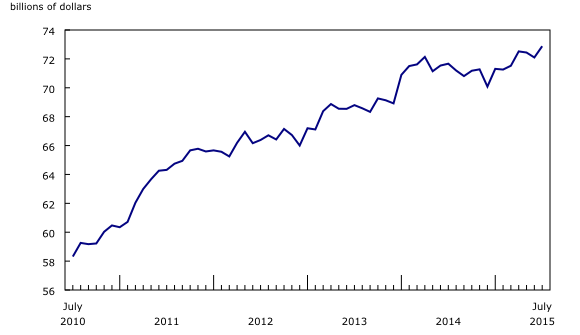 Higher sales in Ontario were responsible for the gains at the national level in July. 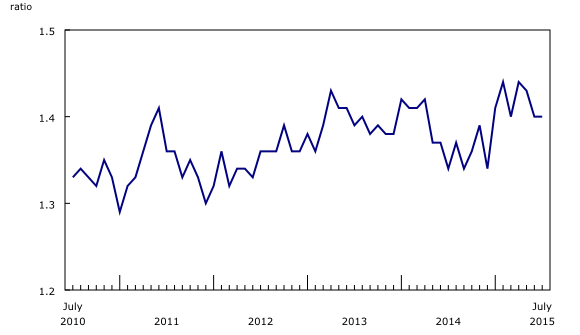 Declines in Quebec and Alberta partially offset the increase. Sales in Ontario rose 4.4% to $24.9 billion, with the gain in transportation equipment accounting for over three-quarters of the dollar gains. Following a 4.8% increase in June, sales of motor vehicles rose 6.0% to their highest level since November 2007. Sales of motor vehicle parts increased 12.5% in July. Production in the aerospace product and parts industry also rose in July. Sales in Quebec fell 1.8% to $12.2 billion, following two consecutive gains. Production of aerospace product and parts fell 21.1% and was the main contributor to the decline. Aerospace production is much more volatile than the manufacturing sector as a whole; hence, the decline in July was not unusually large for the industry. Lower sales of primary metals (-5.4%) also contributed to the decline. As a result of declines in multiple industries, sales fell 1.6% to $5.9 billion in Alberta. Sales of chemical products decreased 2.9% to $1.1 billion. In the primary metal industry, widespread declines among manufacturers led to a 20.6% drop in sales for the industry. Sales of machinery products decreased 4.0%, the fifth decline in 2015. The downward trend for the machinery industry in 2015 is partly related to lower sales of mining and oil and gas field machinery, a sub-industry with close ties to oil and gas extraction. After experiencing growth during the post-recession oil and gas boom, sales for this sub-industry declined 56.6% on an unadjusted basis from the December 2014 to July 2015. Inventories rose 1.1% to $72.9 billion in July. About three-quarters of the gain stemmed from higher inventories in the transportation equipment industry. 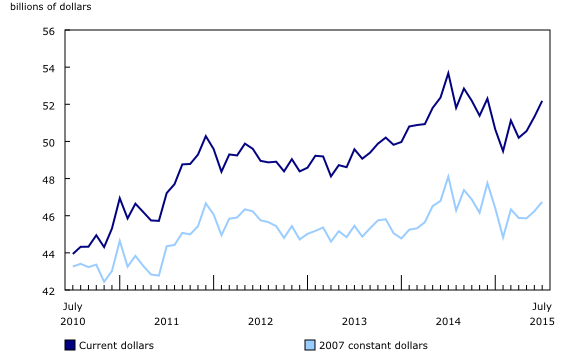 Aerospace product and parts inventories rose 3.8% to $8.6 billion in July, largely as a result of the gain in the value of the US dollar relative to the Canadian dollar over the course of the month. A substantial portion of inventories in the aerospace industry are held in US dollars. Inventories advanced 11.3% in the motor vehicle industry, largely because of an increase in finished products held by manufacturers in the industry. In the motor vehicle parts industry, inventory levels rose 3.8%. The inventory-to-sales ratio was unchanged from June and stood at 1.40 in July. The inventory-to-sales ratio is a measure of the time, in months, that would be required to exhaust inventories if sales were to remain at their current level. Unfilled orders rose 2.7% to $96.4 billion in July, following five months of declines. The gain stemmed from higher unfilled orders in the aerospace product and parts industry. Excluding the aerospace industry, unfilled orders declined 0.1%. 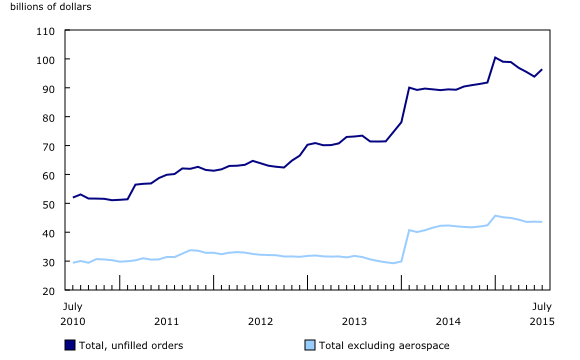 In the aerospace industry, unfilled orders were up 5.2% to $52.8 billion. The gain was mostly caused by an increase in the value of the US dollar relative to the Canadian dollar in July. The majority of unfilled orders in the industry are held in US dollars. New orders rose 10.2% to $54.8 billion in July. The gain mostly reflected an increase in new orders in the aerospace industry. Monthly data in this release are seasonally adjusted and are expressed in current dollars unless otherwise specified. For more information on seasonal adjustment, refer to the document "Seasonally adjusted data – Frequently asked questions." For the aerospace industry and shipbuilding industries, the value of production is used instead of sales of goods manufactured. This value is calculated by adjusting monthly sales of goods manufactured by the monthly change in inventories of goods in process and finished products manufactured. Production is used due to the extended period of time that it normally takes to manufacture products in those industries. For sales, based on the assumption that they occur throughout the month, the average monthly exchange rate for the reference month (noon spot rate) established by the Bank of Canada is used for the conversion. The monthly average exchange rate is available on CANSIM table 176-0064. Inventories and unfilled orders are reported at the end of the reference period. For most respondents, the noon spot exchange rate on the last working day of the month is used for the conversion of these variables. However, some manufacturers choose to report their data as of a day other than the last day of the month. In these instances, the noon spot exchange rate on the day selected by the respondent is used. Because of exchange rate fluctuations, the noon spot exchange rate on the day selected by the respondent can differ from both the exchange rate on last working day of the month and the monthly average exchange rate. Noon spot exchange rate data are available in CANSIM table 176-0067. Real-time CANSIM tables 304-8014, 304-8015 and 377-8009 will be updated on September 23. For more information, consult the document "Real-time CANSIM tables." Data from the August Monthly Survey of Manufacturing will be released on October 16. The analytical paper "Manufacturing: The Year 2014 in Review," released on September 2 as part of Analysis in Brief (Catalogue number11-621-M), is available from the Browse by key resource module of our website under Publications.